Jill Lepore, the author of the terrific cultural history, The Secret History of Wonder Woman (2015) is coming to my campus in Chicago soon, so I thought I would check out how Wonder Woman is introduced to kids. I also have recently read Ron Regé, Jr.'s independently produced Diana, http://ronregejr.storenvy.com/product...which looks at the history of Wonder Woman from her mythological roots, and I really like that. Neither book is for kids, clearly.Cosentino, who dedicates his book to Wonder Woman's creator, psychologist William Moultom Marston, is making a book to get kids excited about this comic hero, so of course doesn't get too deeply into all the delicious politics Lepore does. He also doesn't adopt a comics style, but the art is big and bold and splashy and poster-colorish, especially attractive for kids, I'd guess, and in case you are wondering, Wonder Woman's "proportions" are not problematic. He highlights her strength and like Regé, her roots in Greek mythology. I hadn't expected to like it, but I did. I thought it was way short, of course, and sort of fragmented, but is a decent introduction for kids. And 11 year old Harry thought it was "cool. I liked the art, and the story was interesting." This is a cute little introduction to the Wonder Woman franchise. Though some minor details are worded so as not to tell the original story as well as the comics do and the actual storytelling left a lot to be desired, I loved the artwork and thought it better explained the mythos. I think a full series like this, explaining the origins of famed superheroes is a great way to get a whole new generation of kids into comics. Eh. I generally consider these Cosentino picture books (see also Batman, Superman) to be kind of a missed opportunity. So many little kids are looking for superhero books, but until they are into the Beginning Readers there isn't anything for them. I love the artwork in these - it's bold and exciting, and not too detailed - but the text is always so choppy, it's hard to make sense of it. So nice to see a full book about Wonder Woman that really focuses on her strength. (Such a difference from "Wonder Woman pushes the swing.") Her outfit is what it is, and her proportions are a bit extreme in a couple pictures, but otherwise a very positive example of a female super hero. Wonder Woman: The Story of the Amazon Princess is a graphic novel for young readers that is narrated by Diana, better known as Wonder Woman. The book begins with Diana’s origins on Paradise Island amongst the Amazons, shifting to an introduction to the enemies she fights and her various weapons. However, the transition is choppy, with no true effort to meld the two sections. The text is presented in square white boxes and is appropriate for elementary school-aged readers. However, the first letter of sentences is in red and placed in a black circle, creating a learning curve for the reader. Cosentino’s illustrations are a good transition from picture books to comics, with many full spreads with bleeds, with only occasional inset panels and panel sequences. He uses thick black lines filled with bright colors that are appealing and consistent with the traditional Wonder Woman comic books. Although Cosentino reimagines Wonder Women, she is still curvy and scantily dressed in a costume from the area of the 1970s television show. This continuation of the sexist aspect of the traditional comic and the subtitle of “princess” is disappointing given Cosentino’s positive and revisionist mission of Wonder Woman “to teach peace and respect to all, and to show the world how to live in harmony with nature.” Nevertheless, this is a solid counter to the male-dominated superhero books for children. Illustrations have a few nice nods to classical Greek art. The story is disjointed and probably best appreciated by someone who is familiar with classic Wonder Woman comics or television already (i.e. not a child). I loved the boldness of the art, and the bright colors, and my 5-year old son loved seeing Wonder Woman as a kid, but the text was choppy and not well written in places. When I was at work today I happened to be filling in displays when I saw this picture book at which point I immediately got super excited and had to check it out. 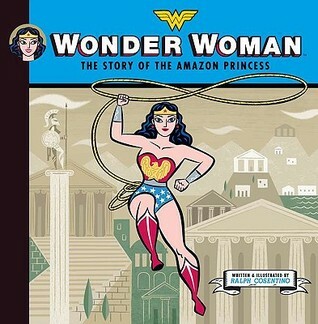 This picture book gives a great introduction to Wonder Woman. It shows the reader what she does as a super hero, her birth, her major villains, secret identity and the contest she was in to become Wonder Woman. There is no mention of Steve Trevor and it sticks to origins that focus on the Greek Gods.The illustration style is interesting. It's not one from the comics but Wonder Woman is recognizable, which is very important. I did feel like there wasn't enough differentiation between Wonder Woman's face and her mother's sometimes. I understand they should look alike but there was one page where I almost couldn't tell it was supposed to be her mother.Other then the minor snafu w/ the illustrations I did really like the book. As I said previously I thought it was a great intro to Wonder Woman. I would love to see books like this for other female super heroes....Super Girl or Bat Girl maybe? My three-year-old daughter is in love with this book. She really likes "reading" the comics for kids, so having a story book with a superhero in it is great. But, the story doesn't flow very well, and I almost think I might have a copy with pages in the wrong order or something. Anyways! Pros about this book are that her looks are only mentioned once, and that my daughter now runs around with a ribbon in her hand and a headband on her forehead trying to catch people in her "lasso." Cons are that the story is pretty annoying on the twentieth read, and that the adorable lassoing is accompanied by kicking whoever she has discovered to secretly be a dragon. This is a brief book that goes into the origin story of Wonder Woman and also introduces some of the major villains that she faces (presumably, I haven't read any Wonder Woman comics). With the big movie being released this summer, I was glad to introduce this book to my daughter and she really enjoys it. The art isn't spectacular and the story more focused on introductions then being completely coherent. I'm happy this book exists (we need more picture books featuring characters otherwise found in comic books! ), but it feels like it could have been so much better than I can't help being a little disappointed. Bright, cool to look at illustrations. I won't hesitate to recommend it to readers, but I hope there will be more impressive books in this vein in the future. My husband read this book to my six-year-old son, and they really seemed to like it. Of course, I think they were more drawn to the illustrations than the text. From what I heard, this was a pretty comprehensive introduction to the Wonder Woman lore. I liked the illustrations and I didn't know Wonder Woman's origin story, so that was interesting. But the story reads more like an introduction, something that runs under the credits of a television show. It glosses over the story without giving a lot of details. A solid primer. Absolutely awesome and a must-have for people with little superhero fans or who just love Wonder Woman. The illustrations are very Grecian Urn-inspired and I really loved the way Diana's story was presented from beginning to end. Wonder Woman is awesome, and this book is a great introduction to who she is as a character. It shows her mythological roots without overwhelming children, and clearly portrays her as a strong heroine. I love that this explains Wonder Woman in a way that preschoolers can understand. I have so many preschoolers that want to check out the Super Hero graphic novels but most of the time those books are just too much for them. I'm excited to check out the rest of the books in this series! There are so many great picture books out there. I love that I'm getting to explore them. I read this with my sons at home. Both are really into super heroes and liked to learn more about what Wonder Woman came from. Also the pictures helped to enhance the story. This is going to work perfectly for our Wonder Woman program next week! It has colorful illustrations and the story is not too long but highlights so much about Wonder Woman. Trying to interest the kiddos in all things comic book this summer, and this is a great introduction to Wonder Woman, if a little bit above Lil Girl's reading level. This was much better than his Superman book, and the little one liked it as well. Whose origin story is this, anyway? Here's hoping this is part of a new obsession for my niece and nephew. Simple telling of WW's origin, but I absolutely love the art! It is done in an Ancient Greek style, which definitely fits Diana.